Alipurduar: A drone has been deployed to keep watch on the Dooars Utsav. Sources said Apart from it high towers have been constructed from which security personnel are keeping close watch on the ground to prevent any untoward incident during Utsav days. For the first time the committee has made a Selfi Zone in the ground, free WiFi service in the ground. The Utsav started yesterday and will continue upto January 7. As Alipurduar district is adjacent to Assam in the east and Bhutan on the north. Naturally miscreants like poachers, members of different militant outfits active in Assam or Bhutan try to infiltrate in Alipurduar district. The town has witnessed number of bomb blasts in the past. So the Utsav Committee does not want to take any risk. Sitting at a place the operator can watch the movements of the people moving inside the Utsav ground. If anything is found suspicious the police officials will be contacted. To help the police one snifter dog is also there. Sourav Chakroborty General Secretary of Dooars Utsav Committee said, " This is the first time artists from Bhutan, Nepal, Bangladesh will be on stage and famous artist like Kumar Sanu will also perform in the Utsav. Hundreds of Folk artists will also perform on stage. We don't want to take any risk. So, we have brought a drone and a sniffer dog. We have constructed high towers on the ground." 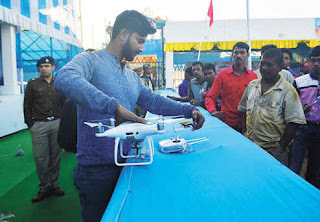 A drone has been deployed to keep watch on the Dooars Utsav. Sources said Apart from it high towers have been constructed from which security personnel are keeping close watch on the ground to prevent any untoward incident during Utsav days.